* Compact range. 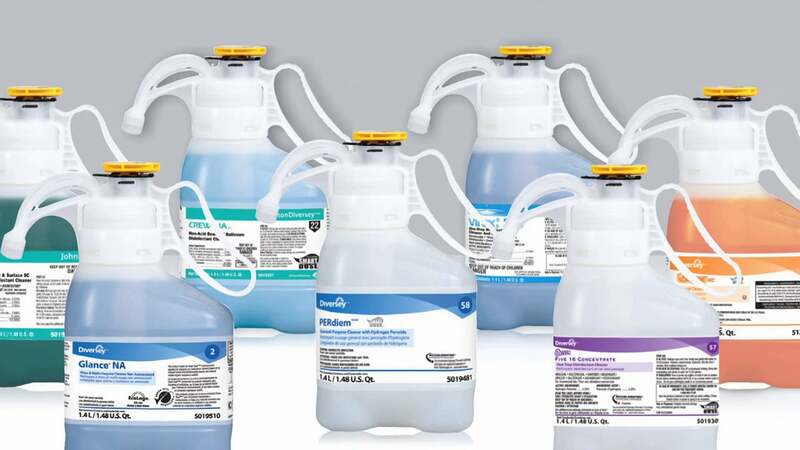 Frequently used products for use in spray bottles, buckets or sinks. * Predictable, low cost in use. Concentrated, effective formulations combined with accurate dosing improve cost-efficiency. * Concentrated. One pouch = 300 triggers or 150 buckets. * Easy to use. Colour-coded pouches & spray bottle for easy recognition. * Easy to install. No plumbing or electrical connections required. 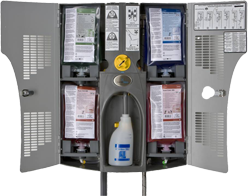 QuattroSelect is a dilution control station that offers the very best of dilution control for large sites. The lockable unit uses up to four super-concentrated chemicals simultaneously. Simply turn the smart valve selector to the desired product and begin filling. The unit offers two flow rates to make bucket and trigger filling timely and easy. The system uses colour-coded super-concentrated products to make training easy, and with no neat contact of product for staff, it offers superior user safety. 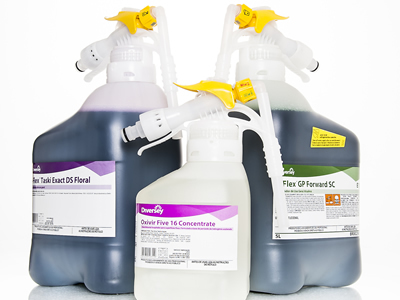 The J-Flex System brings you accurate dosed concentrated products. The unique dosing head incorporated into J-FLEX pack is specially calibrated for each product and ensures that the right solution is available for use every time. Versatility and flexibility – because the J-FLEX unit has the option to deliver two levels of dilution and water flow the same product can be used in spray bottle and bucket applications. The simple plug in hose connector makes the system truly portable. 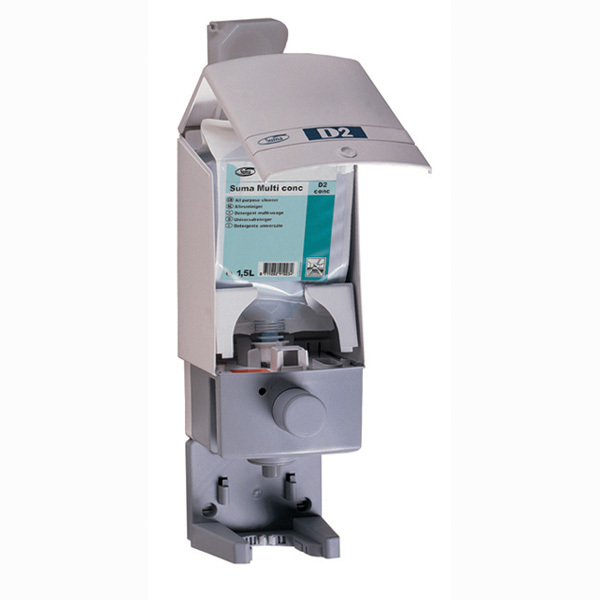 Absolute reliability – The J-FLEX system is unique in that the entire dilution control unit is disposable. 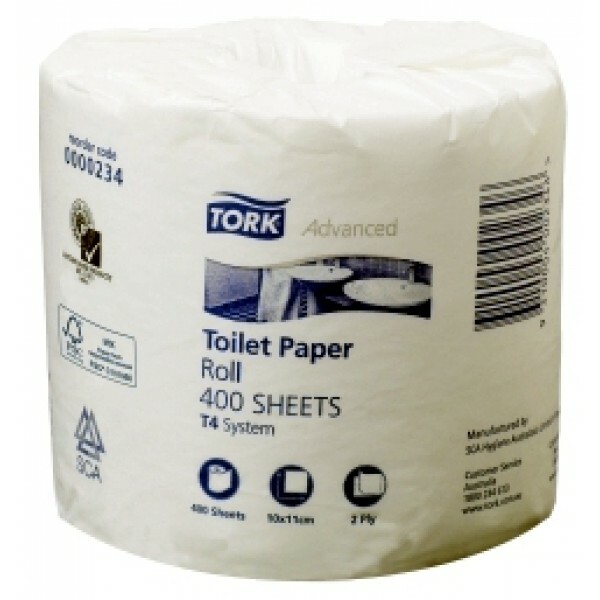 This effectively eliminates the risk of breakdown or inaccurate dosing due to the poor maintenance. Simplicity and safety in use – With its simple “plug in – pull out” hose connector, its colour coded labels with clear application icons and dilution symbols, the J-FLEX system is easy to train in and easy to use by even the most inexperienced staff. The sealed “Spill Tite” packaging system ensures that operators can never come into contact with the concentrated product. SmartDose is an innovative dosing platform for super concentrate daily cleaners and disinfectants setting a new industry benchmark of accuracy, simplicity and safety for the users without the need for a connected water supply. The Smart pump technology is very practical and uses icon based instructions. This makes it possible to vary shot sizes for any of the different cleaning methods including spray cleaning, bucket cleaning or scrubber driers, but requires minimal user training and no measuring. And being a closed system, it provides the maximum level of safety and cost control. SmartDose also dramatically reduces the environmental footprint of all its users and is fully recyclable. SmartDose offers packaging, chemical, storage as well as transport benefits versus standard platforms.